An article in 2016 about then-Yahoo CEO Marissa Mayer focused on a sample version of Mayer’s CV, put together by resume-creation company, enhancv. In other words, this was not Mayer’s own actual CV as written by her; this was a promotional product made by an organisation in the business of selling resume-writing services. Nonetheless, the article went on to point out statements in “her CV” as flaws or warnings about Mayer’s less successful professional decisions. The article then used a quote from Mayer from eight years prior — about her cupcake baking — as early evidence of micromanagement tendencies that would later surface during her Yahoo years. The article ended on the ominous note “After looking over her credentials on this résumé, would you hire Marissa Mayer?” There’s consistent reporting of the bias in media coverage of women CEOs. Here, if we may delicately assume that cupcake baking is 1) more frequently done by women and 2) not a skillset integral to running a major tech company, such bias is not hard to find. Female leaders have many challenges not faced by men. 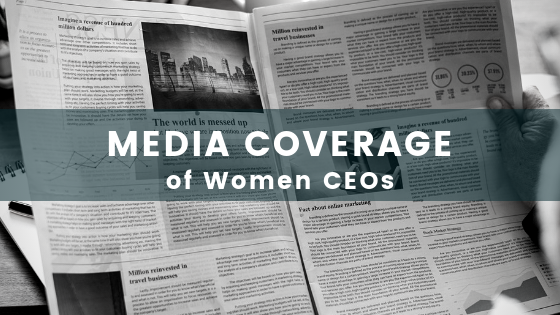 Media coverage of women CEOs is one of them. Family first. A study of media coverage of women CEOs, highlighted the multiple subtle and not-so-subtle ways articles varied by gender. One statistic was the way and the degree to which personal lives were covered. 16% of the articles about female CEOs included comments about their personal lives versus 8% of the male CEOs. Of those articles that included personal lives information, 78% of those about women included their families, none of those about men’s personal lives included their families. A look at the infographic on the CV entitled “A Day in My Life” shows from the top left down (where we naturally read first) labelled as time spent with her husband and children, time making cupcakes, and time as a board member of the New York City Ballet and Jawbone. The right side has her workday activities. To be fair, it’s possible that women CEOs mention their families more – balancing having a family and a career is a major issue for working women at all levels and everywhere. (We talked about this issue previously here). And it’s not necessarily a bad thing, arguably even a good thing, to hear women talk about their families, especially as it pertains to uniquely female intersections like working while pregnant, nursing facilities at the office and other biological realities. And for her part, Marissa Mayer later praised the CV. “Miss”-takes aren’t “miss”-ed. None of this is meant to suggest that Marissa Mayer didn’t make mistakes in her tenure at Yahoo. Maybe many. Maybe critical. Not enough to keep share price from tripling during her time there – yet possibly enough to prevent her getting credit for it (that rise was attributed to areas of the business that were already successful and minimally impacted by Mayer). But equally, she was the 4th CEO in four years to lead a company that by most accounts was in a critical state of struggles. The point is not that she should be written about glowingly with regard to her career, but that when we try to explain it, we should not look to her cupcake recipe methodology for the answer. This is just one example of media coverage of women CEOs. But it’s hardly the exception. What about those cupcakes, anyway? According to a 2008 article in San Francisco Magazine, Mayer says she found multiple cupcake recipes, put them into an excel spreadsheet, broken down by ingredients. She then analysed the overlay of common inputs, and used those results to make up her own recipe. Or something. Whatever — you’re not going to bake that way and neither am I. But if you heard a male computer science graduate and early coder for Google did that, how surprised would you be, really? And would your next thought be, clearly that shows micromanagement tendencies that will derail his future as CEO of Yahoo? And not to get persnickety, but at the time the article was written, Mayer wasn’t actually looking for a job. She was gainfully employed as CEO of a Fortune 500 company – that was eventually sold to another Fortune 500 company at a valuation of $4.48 billion. She had been continuously employed since graduating from university with a Master’s in computer science; her first job being a coder at Google (as employee #20 – and yes, female employee #1). Between her early stock holdings at Google and golden parachute terms at Yahoo it was estimated that if she were to become unemployed, her net worth would be $600 million — roughly six times the entire cupcake industry. So, the answer to “would you hire Marissa Mayer?” might well be yes. Even to bake cupcakes.